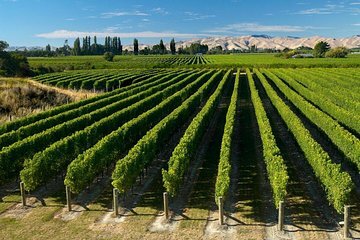 After an early afternoon pickup from your Picton or Blenheim accommodation, travel in a comfortable climate-controlled minivan to the Marlborough wine region. Along the way, your guide shares informative commentary about the region as the scenic landscape of vineyards and hills rolls by the window. Stop at four of Marlborough’s top wineries to sample wines such as Pinot Noir, Sauvignon Blanc, Pinot Gris and Riesling varietals. Stroll through the vineyards, learn more about New Zealand wines, and have the option to purchase lunch at one of the wineries. Your tour ends with hotel drop-off in the early evening. If you are arriving on the Interislander ferry which berths at 12.30 you will not be in time for this tour. The Bluebridge ferry arrives at 1145 and will give you time to take this tour. We do not take luggage. Friendly, informative tour to a combination of lesser known wineries (Bladon and Framingham) along with bigger ones (AlanScott and Saint Clair). Delano our quite was great...although having done a tour with and without lunch, with lunch makes the better experience IMHO. Kevin was great, we even saw him the next day in Picton! He was very knowledgeable about the area and even took us to the chocolate factory to end the tour. Other tour passengers were so nice and loved sharing their experiences. Went to 4 vineyards... Lawsons, Spy Valley, No.1 and Nautilus. Bottles ranged from 20 to 30 each and were wonderful. Superbe excursion, très belle vue. Je recommande surtout le dernier vignoble monté par un français d'oirigine la jeune hôtesse vous parle en français. Chapeau! Les vins sont excellents et les hôtes compétents et accueillants. Weinproben sind natürlich ein Muss, wenn man hier in der Region ist. Vier verschiedene Weingüter werden angefahren, überall großzügige Tastings. Fahrer versucht bei der Auswahl auf die Wünsche der Gruppe einzugehen. Alles top!